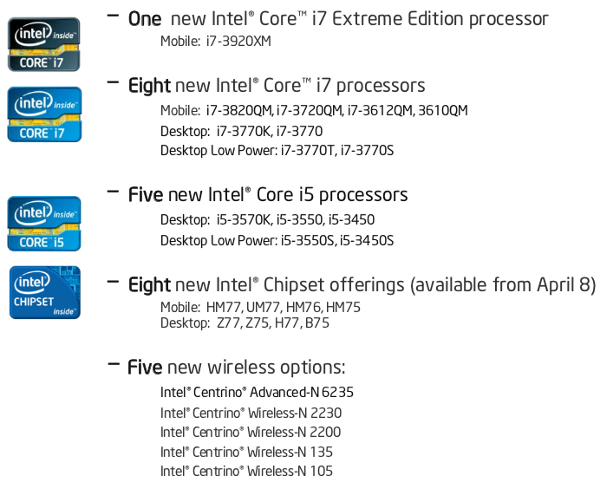 Intel is launching their Ivy Bridge CPU family today with a lot of fanfare, and in many ways the chip deserves every bit. The technical brilliance is however destroyed by some foul marketing garbage and scary anti-user ‘features’. Ivy Brige, also known as 3rd Generation Intel(R) Core(TM) Processor Family, with iSomethingMeaningless and seemingly random numbers and letters prefixed, suffixed, and haphazardly stuck in all over. All the current chips launched today are the same die, a 160mm^2 CPU made on a 22nm tri-gate process that no one in the industry can come close to matching. In total, there are 14 CPU SKUs, eight chipsets, again from one die, and five wireless radios for the silicon side. Wrap all this in purposefully confusing marketing, and you end up with Ivy Bridge. It looks like this. If you are wondering why I mock the Intel marketers, the above listing is a good example of what I mean. What is the difference between an i7-3770, i7-3770K, i7-3770T, and i7-3770S? The biggest leap of technology for Ivy Bridge seems to be nothing more than upgrading the model picker’s random number generator to add a random letter generator, blindfold, and dartboard. More on this kind of fun later though. There will be several variants of Ivy Bridge that launch later on, and presumably a dual core version, but today we get only quad core CPUs, and higher end ones at that. All of the chips that launch today are the higher two variants of the noxious and anti-consumer iSomethingmeaningless branding scheme, i5 and i7, with both mobile and desktop versions, as well as an Extreme Edition tossed in for good measure. The i3 and Pentium variants will come later, as will the vPro and Ultrathin variants. As the case for modern silicon, the speed differences between the various model names are not enough to make a difference to the end user. On the desktop side, the base frequency range is between 2.5GHz and 3.5GHz, meaning the ‘worst’ CPU you can get is about 70% the speed of the ‘best’ Similarly, on the mobile front, the speeds go from 2.1GHz to 2.9GHz, again a hair over 70%. Unlike the old days, this isn’t enough to make a real world difference, especially in light of how much time CPUs spend at idle, and how many of the threads go unused. On the mobile front, the faster CPUs can actually save significant power under light loads, IE the majority of the time. They do this by waking up, doing the job, and then going to sleep faster than the slower parts. This counter-intuitive situation does actually save power for the majority of applications, so even if you get a 45W TDP CPU, you may end up with better battery life than a 35W CPU. On the desktop side though, the differences are just, well, mostly pointless. That said, take a look at the actual offerings that are coming out, first mobile, then desktop. The first thing you might notice is that the differences between the SKUs are vanishingly small. Clock speeds, as discussed above, vary by a max of 30%, max turbo by less than that. All GPUs run at 650MHz, with max turbo ranging from a high of 1300MHz to a low of 1100MHz on the mobile front, a paltry 1150MHz to 1100MHz range on the desktop side, and the five SKUs with the 16-shader ‘HD4000’ GPU don’t vary at all. 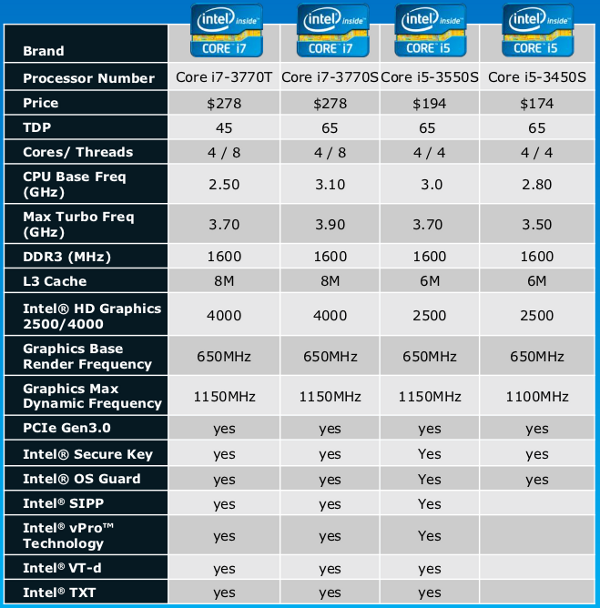 If you are looking for real differences, about the most you can hope for is the i5/i7 split. i5s have a 6MB L3 cache and HT disabled, the i7 has HT on for 8 threads from four cores, and 8MB of L3 cache. Unless you run benchmarks for enjoyment, and nuance differences in bar charts are important to you, you will never notice any difference in the real world between these parts. You can see some differences in games, but if that matters at all, get an external GPU, you will be far better off. There are a lot of features in the checkboxes near the bottom, and a plethora of other marketing terms that ruin an otherwise good chip. They fall in to six categories, Smart Performance, Stunning Media Experience, Enhanced 3D Performance, Display Enhancements, Manageability and Security, and I/O Performance. Each of these has a dictionary of marketing terms to go with it, so lets dive in even though it feels like the marketing equivalent of the river speech from Apocalypse Now. 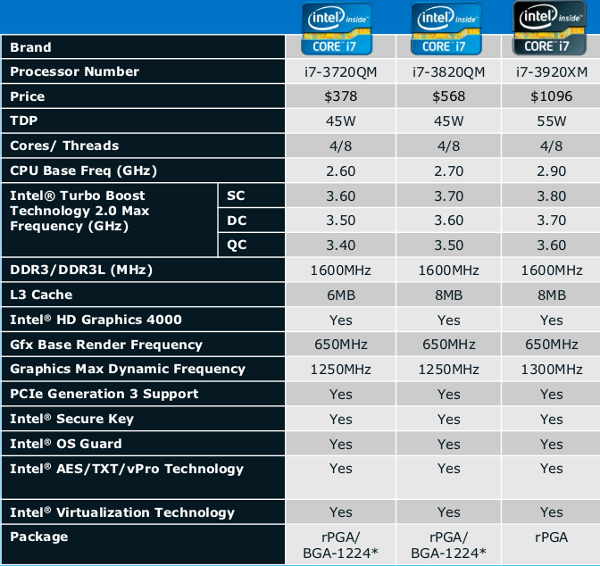 Smart Performance starts out with the 22nm process that Ivy Bridge is made on, and this is a clear win for Intel. As we have said, no other company comes close to the capabilities of this process, and no other foundry will have it for probably four years, if then. It saves huge amounts of power, especially when looking at transistor leakage. The TDP of Ivy Bridge desktop parts is 77W compared to 95W for its 32nm predecessor, Sandy Bridge, a huge savings. This may not seem like a massive drop, especially in light of the <10% CPU core performance gain at like clocks, but it is. The die is now 160mm^2 and has 1.4 billion transistors compared to 216mm^2 and 1.16 billion transistors for Sandy Bridge, and power went down too. What most people forget is that the GPU performance has gone up by a minimum of 50%, and doubled in several cases, as has video transcoding speed. GPUs are a huge power hog, and total chip power still dropped by about 20%, that is an incredible gain for a modern CPU. If you look for last time TDPs went down without an attendant drop in performance, you will be hard pressed to find as significant an example as Ivy. The other buzzwords in the box are horribly dubious, Smart Response, Smart Connect, and Rapid Start, all mis-labled as technologies. Smart Response is a mis-labeling of using an SSD for caching of a full sized HD, but it is stupid and costs performance. Instead of using a sane OS, this Windows only driver slows things down by not using a the SSD as a drive and then the magnetic HD for added storage. While it can speed things up for some cases, it is never faster than an SSD alone. If you are not building a RAID array, just skip this, the driver problems will cause you pain and data loss sooner rather than later. Smart Connect is another stunningly stupid idea, it is basically a timer that periodically wakes your machine up to download certain data from a few specific sites. The listed examples are email and social networking sites, basically it continually updates your machine while it should be asleep. For the shallow and desperate, this will seem like a good idea until it runs their battery out for something that would normally take a few seconds to accomplish once you reboot. This is technology? Smart people use their phone for this, you should too. That contravenes Intel’s marketing objectives though. Rapid Start is another one that falls under the aegis of “How stupid do they think we are?” The answer is, “Very stupid” in light of this ‘technology’ being a fast wake up from suspend. In Windows only, it takes an image of the system memory and loads it faster than the MS internal variant, a claimed 70% faster. This article is written on a three generation older Intel CPU that is a fraction of the speed of the current offerings. It forgoes Windows and uses Linux Mint 12. Ironically, it does what Rapid Start ‘Technology’ does in less than the claimed 5-7 seconds. With an Ivy Bridge, it should drop that to far less than Intel could hope for. Technology indeed, skip it for the looming driver headaches and incompatibilities. The next big box is Stunning Media Experience, and it comprises a few good bits, some dubious ones, and some that are downright evil in their anti-user bent. They are improved QuickSync, Intel Insider, Wireless Display (Wi-Di), InTru 3D, and HD video conferencing. Most are, well, complete farces, but that will never stop the marketeers. On the good list is improved QuickSync, the Intel video encoding technology that uses the GPU and CPU to transcode HD content faster than real time. It debuted in Sandy Bridge, and Ivy’s variant is 50+% faster, supports more formats, and is a good thing for the most part. We say most part because Intel sort of supports this in Windows, but doesn’t anywhere else. The Linux driver situation is getting better, but on older distros, things never get fixed, so we can’t say if QuickSync actually works. Hopefully Ivy will change this, the signs look hopeful so far. Other than drivers, Ivy QuickSync is a step up from a good thing. More dubious are Wi-Di, InTru 3D, and HD video conferencing. Wi-Di is a proprietary format for wireless display technology that is available in standards compliant formats from the rest of the consumer electronics industry. Intel makes a standard that is compatible with their own hardware, a vanishingly small subset of TVs, and doesn’t work with everything else. Not a good thing, and anyone who bought the first version of Wi-Di got burnt, the second is shaping up to be the same glass house. Avoid. InTru 3D and HD video conferencing are just drum beating for things that should be considered standard issue on any modern device. If you can play a Blu-Ray 3D disk, you should be able to support 3D. Intel is saying they can, which makes you wonder about past products, but I guess not completely broken is a refreshing change for Intel graphics. Same with HD video conferencing, if you can encode HD in real time or better, why couldn’t you send it over a network? Head scratchers both. 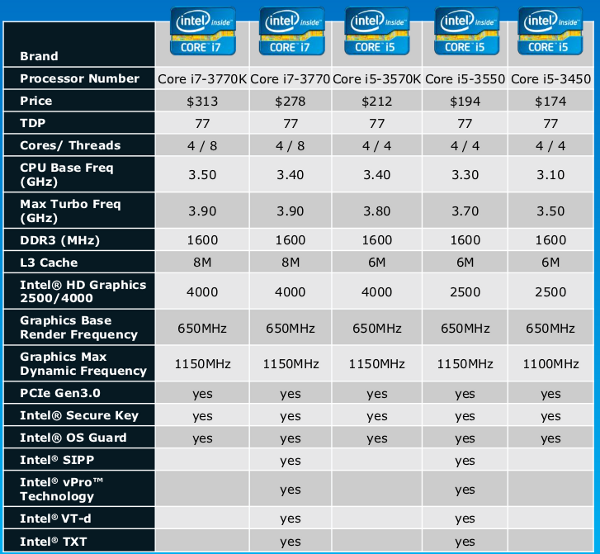 That last one is Intel Insider, and it is a horrendous step backward for Ivy Bridge, and Sandy Bridge before it. Basically it spends power and time to encrypt everything on the system buses. It is useless work, lessened battery life, and the only reason it is there is to placate the content MAFIAA. To make matters worse, Intel Insider is not user controllable, it is only controllable by unnamed remote 3rd parties who can now do things to your system that Intel won’t list. Seriously, think about the security implications, you are giving an unknown list of entities that are proven to be hostile to users the right to silently deny you use of your computer. They can potentially put things on your PC, take things off, and do so in a way that you can’t control, avoid, or worst of all detect. This ‘technology’ is actively harmful to the owner, and enough of an issue that I suggest that you avoid Ivy Bridge until it is not just fully documented, but user controllable. Scary on a whole new level. Enhanced 3D performance is another box full of line items, and those are enhanced 3D graphics, DirectX 11, OpenGL 3.1, and OpenCL 1.1 support. Ivy Bridge has a completely new shader architecture from its predecessor Sandy Bridge, and performance goes up radically. Thomas Ryan will go in to more detail in separate articles, but Ivy is a huge step up in GPU speed, almost matching AMD’s Llano/A8 for pace. The new GPUs come in HD2500 and HD4000 flavors, with the former having 6 shaders, the latter 16. They are all new though, and even with the HD4000 having only a 33% higher raw shader count, throughput almost doubled. We will go in to details in a separate article, but this is once again a good thing. On top of that, the feature set caught up to an almost modern GPU. Sandy Bridge was woefully behind in standards support, but with DX11 support, Ivy is right up there with the best discrete GPU on the Microsoft checkbox benchmark. OpenGL 3.1 and OpenCL 1.1 support are a little bit behind the times, but far closer to current than any other Intel GPU at launch. It may not be bleeding edge, but for once, Ivy Bridge’s GPU is nothing to outright sneer at. Another one that moves Intel much closer to modern is the Display Enhancements box, and this one is pretty much all good. Ivy now supports three independent displays, catching it up to Llano and and some modern GPUs. All three can be independent and do not have to be symmetric, the one restriction being only one analog output. That means 1 analog and two digital or three digital, mix and match digitals if you want. Support on the digital side is for HDMI 1.4a but only DisplayPort 1.1, not 1.2, all crushingly DRM infected. Intel seems to be avoiding DP1.2 because it’s broken Light Peak/Thunderbolt link can’t support it. Anyone sense another USB3.0 monopolistic power play here? Me too, and once again, users suffer for Intel’s technical games. On a technical note, the video is connected from the CPU to the FCH (aka chipset) via two FDI links. When asked, Intel flatly refused to say how fast wide or fast those links are, or if they differed at all from the FDI links used on the Sandy Bridge generation of parts. The only thing remotely technical about them was in the press slide deck, and it said that there are eight lanes that can be configured in to two channels of 1×4 or 2×2. Intel would not comment on what those did, what that meant, or how much data they could carry. This is most likely because they, like Thunderbolt, are wholly inadequate for the tasks marketing claims they can to do. Take the three panel claim with a BIG grain of salt until proven by a third party. This is likely the reason for no DP1.2 support. Manageability and Support is the next big box, and that is vPRO plus marketing speak in abundance. It comprises 2012 vPro (AMT8.0), Intel Protected Identity Technology, Protected Transaction Display, Public Key Infrastructure, Intel Anti Theft Technology 4.0, Intel Small Business Advantage, Intel OS Guard (SMEP), and Intel Secure Key (PPDRNG). Some of this is real tech in the underlying hardware, others are Windows only software bundles, but all of it is to be launched later when the new Q-series chipsets launch. Unfortunately, it is pretty much all based on Intel’s trusted hardware and Windows, both of which are proven insecure and vulnerable. More when Intel decides to talk about it. The last box is I/O performance, and that is PCIe3, USB3, SATA6, and wireless. In its minimally fused off form, Ivy along with a 7-series chipset can support 20 PCIe3 lanes in a 1×16 or 2×8 lane configuration plus four more lanes. On top of that, the chipset itself can do eight more PCIe 2.0 lanes. For USB, Intel finally catches up with the last decade and allows up to four native USB3 ports along with ten USB2 ports, all off the chipset. If that isn’t enough, you can put in up to six SATA6Gbps ports as well, again off the chipset. This would all be a good thing, but Intel raises one red flag, and it is a huge one. All of the SATA, USB and PCIe2, but not the PCIe3, is rooted in the FCH (chipset), something that is usually not a big deal. The CPU to FCH link is via two video only FDI links and one DMI2.0 link. Intel flatly refused to say anything about what the DMI2.0 link was, be it speed, width, capabilities, or anything else. It could be the same as the Sandy to 6-series DMI, or it could be faster, wider, or completely new, but they would not say. When Intel does this, it is usually because the technology is abjectly inadequate for the purpose at hand, basically a new Thunderbolt. In this case, the total throughput of the ports, in Gbps, is a bit over 100Gbps (20 (4xUSB3) + 5 (10xUSB2) + 36 (6xSATA6) + 40 (8xPCIe2)). Maxing this is a very unlikely scenario, and other things would choke long before that number was hit, but if the DMI2.0 link is simply 4 PCIe3 lanes with a proprietary overlay like DMI1.0 was with PCIe2, then it is not even close to adequate for a fraction of the job. Anyone still wondering why Intel is not talking about specifics? There are more buzzwords, but beneath it, Ivy has a lot of real tech, and there are many more models to come at later dates. 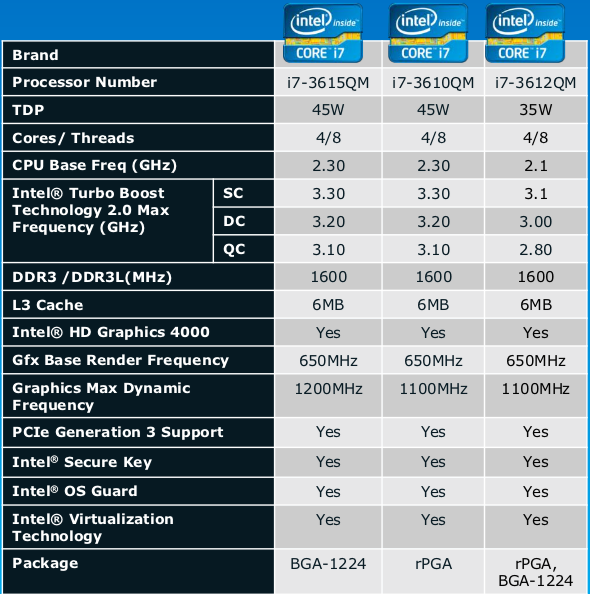 For now, we have a tip of the iceberg in 22nm Intel CPUs, all quad core, no duals yet. The process they are built on leads to small, low power chips that don’t move the bar much on the CPU performance front, but do quite a bit for graphics performance. Better yet, Intel looks to be making progress on the drivers, this round is not abjectly broken. The hardware, other than the horrific Intel Insider DRM infection and remote exploit tool, is very solid.